SANTA CLARA — In a special meeting Tuesday, the Santa Clara Planning Commission approved a recommendation for a zone change in the South Hills area. The rezoning would mean a change from the existing residential zoning to planned development residential on 82.7 acres located at the south end of Gates Lane and on the south side of Clary Hills Drive and extending upslope and to the south. The applicant, Split Rock Development Group, requested the zone change as well as approval of a conditional use permit to allow the proposed dwellings to be built on the 82.7 acres to be used as short-term residential rentals in a resort-style development of approximately 450 units. The proposed resort would be built in eight phases with amenities that could include a pool, clubhouse, cycling and walking paths, a restaurant and a mountain biking pro shop where guests, as well as the public, could rent mountain bikes and have their bikes repaired. With Washington County gaining popularity as a mountain biking mecca, developers and proponents see the resort as an opportunity to create a destination for guests from all over the world to come and enjoy Santa Clara’s trails. Plans for a 50-acre sports park in the South Hills with access to existing trails is already in the works. Information from a fact sheet made available at Tuesday’s meeting states the proposed development would be a full-scale resort that would include the entire property being run by an on-site professional management company specializing in hotel operations. Though nothing is concrete, Patrick Manning, a partner with Split Rock Development, said they have reached out to succesful hoteliers Hilton and Marriott. The fact sheet further states that only single-family, craftsman-style homes not to exceed two stories would be visible from Santa Clara Drive. 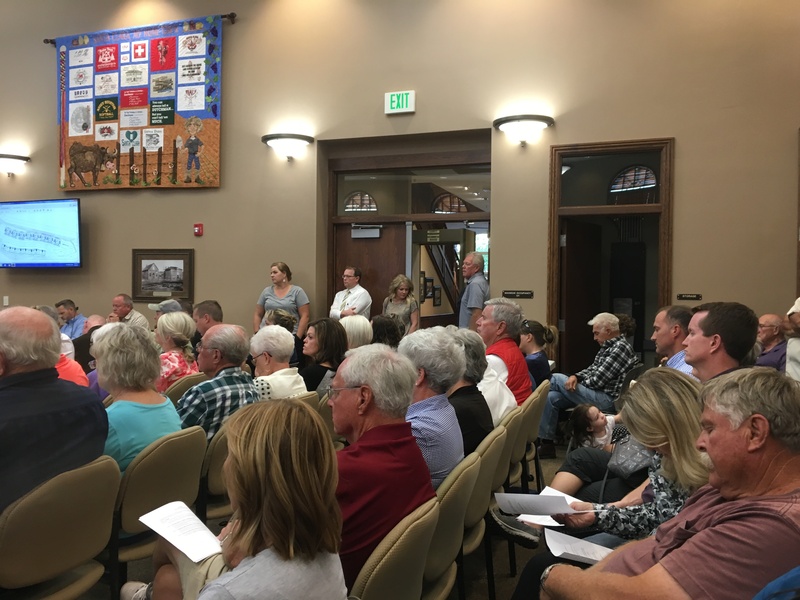 The recommendation for approval came despite a large amount of opposition from Santa Clara residents in attendance who said they prefer to see Santa Clara maintain its small-town feel and preserve its cultural heritage rather than become a destination or resort town. In a saga that has been brewing for over a year – the developer previously proposed a 112 unit condominium development that was narrowly defeated in a June 2016 City Council meeting – residents both new and old filled Santa Clara’s City Hall Tuesday to voice their opinions. Resident Denise Webster described the difference in determining values as being between home and family, on the one hand, and future and change, on the other. Though many residents who expressed opposition to the zone change in Tuesday’s meeting said they were not reticent to see change and growth, they unanimously agreed they are not interested in the kind of change being proposed by Split Rock. Longtime Santa Clara resident Ferron Leavitt said he owns 30 acres adjacent to phase one of the proposed development where he has cattle and a farm. His family has lived in the same place for at least 100 years, he said, and he would like to see that legacy be able to continue. Though he is opposed to short-term rentals, Leavitt conceded that progress is inevitable. That progress could mean a boon to Santa Clara’s economy. Currently the city is largely reliant on property taxes for its revenue, said its Economic Development Commission Chairman Rex Oliver, addressing those in attendance. The addition of 400-plus vacation rentals could bring an influx of visitors who will frequent local shops and restaurants. But despite the possible positive outcomes, many attending the meeting continued to resist, citing concerns ranging from losing the safety and feel of a small community to traffic and density issues, potential for increased crime and worries that out-of-town guests may feel less inclined to care for the city since they are not permanent residents. Among the most hotly contested issues was phase one of the proposed development. As outlined, phase one envisioned 21 single-family homes between 2,100-3,500 square feet each with a swimming pool and a clubhouse. The proposed density for phase one was 2.2 units per acre, which, according to city definitions is considered low density. The entire project has a projected overall density of 5.5 units per acre which is considered medium density. Phase one was proposed to be built on the south side of Clary Hills Drive, putting it between two existing developments underway comprising residential homes. Residents worried that having short-term renters right next to their properties would make their homes less safe and make it so they would not know who their neighbors are – in essence, losing what they said makes Santa Clara a good community. Over the course of the past 12-18 months Split Rock has made several adjustments to its proposal, especially where phase one is concerned. Jensen said the proposals have gone 100-plus units in phase one to 42 and then down to the 21 units proposed during Tuesday’s meeting. But still, opposition remained. As a final concession, Split Rock partners in attendance agreed not to develop phase one as vacation rentals and instead to redraft their plans for single-family residences in that phase. Phases two through eight sit on and behind the ridgeline of the South Hills, separate from the other residential neighborhoods. Those phases will remain short-term rentals. The compromise was seen as a win-win by some on both sides. “We really want to have a happy mix of doing what’s right for Santa Clara and doing what’s right for future guests and owners of the project through the growth,” Manning said. “I think we can live with the recommendation that was adopted,” Leavitt said, adding that he has seen what Split Rock has done with their other developments and he is glad it is them and not someone else. Despite emotions running high on both sides, the meeting, which lasted just shy of five hours, maintained a respectful tone throughout the duration. The commission approved the applicant’s request for a conditional use permit for zones two through eight to be used as short-term rentals in a resort-style development, Jensen said, with the caveat that the developer comply with the development agreement and city ordinance requirements and fulfill the conditions requiring development amenities. The Santa Clara Planning Commission will make its recommendation to the City Council regarding the zone change and the council will vote on the proposal in a special meeting Oct. 4. The details of the special meeting will be specified during the regular City Council meeting Wednesday at 5 p.m. in the council chambers at Santa Clara City Hall, 2603 Santa Clara Drive. A full agenda for Wednesday’s City Council meeting can be found online. As a frequent user of Old 91, riding through downtown Santa Clara, I have to wonder what route all the cars associated to the proposed development will use. We are on the verge of destroying the character of “Old Town” Santa Clara. In some cases, Washington County has done a nice job of getting infrastructure developed in advance of the acute need. We have our share of examples where congestion has been caused because we were well behind in developing roads, etc. While this place is no where near becoming a mountain biking mecca, like Internationally-recognized Moab, folks will continue to escape the Wasatch Front for a respite from cold weather and unhealthy air quality. Quasi-investors will bid up the price of these vacation rentals, because they cannot afford to own their own place outright, but can with the rental income to offset part of their mortgage payments. More top down government owned by the developers and the wealthy land owners. Urban sprawl is ugly sprawl! Citizens have no say. Money is in charge here! is our elected officials, they are not interested in representing the tax payers, only more developement. I would have thought that I might need company like Split Rock would have done more market research. Are they not aware of the hundreds of nightly rental units that are already in the works in our County? I will predict that in a few years they will be back to rezone this to single family has nightly rental home sales have dropped off precipitously. That’s it I believe that a landowner should be able to do what they want with their property as long as they fulfill all of the Cities requirements. Funny to hear people who constantly complain about government overreach suddenly want the local government to step in and prevent development that is within the rights of the landowner. Development is inevitable. However it is up to local government to respect the will of the people. I am just glad that my neighbors stood up, and held their ground. Would be a shame if this development screws up the legacy culture unique to Santa Clara. Not saying it will, but if it does, siyanara, there is no going back. The last gold egg for a split rock, and a dead goose for the rest of us. Hey , you can always move right. Hope same neighbors are still around when the next 200, 500 , or 1000 unit project is proposed and ratified. Tis in the name of progress some may argue, or is it all about $. You decide. I would love to see the images associated with this development. I can’t seem to find anything on the city’s agenda or in this article. Just having a hard time understanding where and how big this is going to be? There is always a “say”. Powerlessness is a choice. The people showed up. There are lawyers in SC. The local government is accountable. I’m on record, for pointing out an error in the SC budget. So it is up to us. I extremely disagree with a previous poster. The local government is not bought and sold. But, We need to keep them in check and citizen oversight Is critical . Once again thank you to my neighbors.